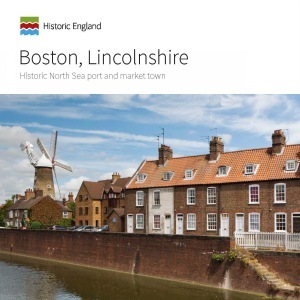 This book examines the history of Boston in Lincolnshire as reflected in its buildings and townscape from medieval times to the present day. Boston has a position as an important market from medieval times and as a major port with links with Europe and America. The homes and warehouses of its citizens show the evidence of this. Boston’s religious and public buildings are discussed, and its physical expansion throughout the 19th and into the 20th century are examined. Other important influences on the town’s development include fen drainage, the role of agriculture and manufacturing, and transport links. Bringing the story up to date, problems created by the town’s remoteness from large centres of population, a low-wage agricultural economy and the impact of 1970s redevelopment are discussed, where they have affected the physical appearance of the town. A final chapter looks at how successful regeneration projects have been in Boston and how these can be built upon to promote a more prosperous future for the town that recognises the important role heritage can play in achieving it. John Minnis is a Senior Investigator at Historic England. Katie Carmichael is a Senior Investigator in Historic England. Clive Fletcher is a Principal Adviser in Historic England. Mary Anderson is an Architect. The book does an excellent job of describing and illustrating Boston's built environment - guildhall, houses, warehouses, pumping station, and more: the pages glow with red brick and pantiles. ... Boston, Lincolnshire should attract visitors, inform locals, and inspire conservationists to preserve the best of this fascinating place. Hats off to that. Like all additions in this series, a lively introductory text and bright cheerful photographs combine with a commentary on modern circumstances. This is an attractive and very readable publication with many excellent photographs and illustrations.